Ed Falco and I share an important bond: we’re both lucky enough to have our work published by Unbridled Books. When we met at the Virginia Festival of the Book in March 2013, he kindly agreed to respond to a few questions about his writing process and his time management strategies, two key matters for most writers. 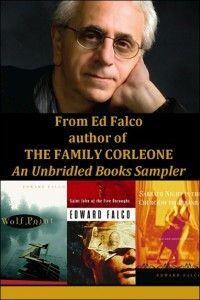 There is a lot more information about Ed Falco and his work at Unbridled Books, which has recently published a Falco Sampler that includes Saint John of the Five Boroughs, Wolf Point, and Sabbath Night in the Church of the Piranha. 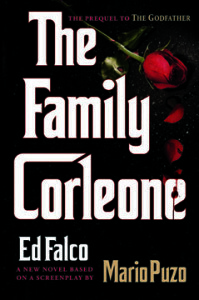 His most recent novel, The Family Corleone, is based on some of the screenplays of Mario Puzo. If you like Raymond Carver, you’ll enjoy Ed Falco’s work. Falco: For most of my life as a writer, I’ve had to balance family and teaching with writing. That usually meant that I’d get a couple of hours every morning to write, and then spend the rest of the day getting everything done that needed to get done so that I could have those couple of hours the following morning. The process turned into a routine: get up, have breakfast and read the paper, then go into my study and write for a couple of hours before rushing off to a class. (For many years, while raising my daughter, I’d make us both breakfast and then run her off to school before coming home and writing.) Beginning a couple of years ago, when I decided I wanted to try to write popular fiction—or at least fiction that had a chance of reaching a popular audience—I started putting in eight hour writing days. I could do this during the summer and on breaks between semesters. I discovered I could write 1,500 to 2,500 words a day, and I’ve been working that way ever since. I’m single and my daughter is grown and off living her life—and that makes it easier to devote more time to writing. Falco: Occasionally I feel like a hermit living in the cave of my study. This is hardly a news flash—but being a serious writer requires spending a awful lot of time alone. That can be difficult. I’m lucky to have a girlfriend who drags me out of the house now and them. It’s a blessing. Falco: It’s a juggling act. One of the great dangers of academia for writers comes from getting so involved with the life of the university that you forget you’re a writer. I’ve always tried to write a couple of hours a day, every day. Then I’ve used the rest of the day to prepare for my teaching. Because of that I’ve always felt like I was working two jobs, rushing from one to the other every day. Personal life has sometimes suffered—but that would be the case for anyone working two jobs. Still, I’ve done my best over the years to balance all three aspects of my life. I’ve done it well at times, at other times, not so much. Falco: Both. It helps in that I’m around exciting young writers (in our MFA program) and I do a lot of careful reading in preparing for my courses. It hinders in that I spend so much of my life reading work in very early stages of readiness for publication. I read thousands of pages of manuscripts every year, with my pen in hand, trying to make them better. I’m sure I’d be a better writer if I were reading thousands of pages of great literature every year. Falco: I just finished the first draft of a new novel, tentatively called Toughs. It’s set in depression-era New York, and it’s based on historical events in the life of a young Irish gangster, Vincent Coll. This entry was posted in Interviews with Poets & Writers on April 13, 2013 by ehuergo.